NAIROBI, Kenya, July 25, 2014 (ENS)- A consignment of contraband ivory was intercepted at Nairobi’s Jomo Kenyatta International Airport today, although the smugglers tried to fool officials by declaring the 12 boxes to be full of live dogs. A joint operation involving officers from Kenya Wildlife Service, Kenya Airports Authority, National Police Service, National Intelligence Service and Swissport security service unearthed the 1,350 pieces of worked ivory packed in cartons at Swissport Cargo Service premises at the airport. The consignment had been delivered to the airport on Thursday, July 24. Weighing 260 kilograms (573 pounds), the shipment of ivory was destined for Kuala Lumpur, Malaysia and was scheduled to be transported through the national flag carrier airline of Turkey, Turkish Airlines. Paul Jinaro, spokesman for the Kenya Wildlife Service, said the shipment was intercepted at the point of declaration where fake declaration forms had been filled out indicating that the cartons contained live dogs. When officials opened the cartons they found the ivory was disguised as wood carvings, painted black and red. 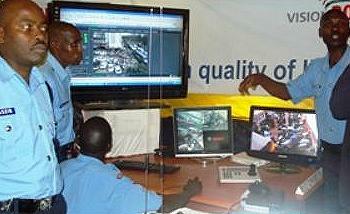 The boxes were labeled as an exhibition commodity from Nairobi Exhibition Company Limited. It is illegal to sell or buy any ivory in Kenya. 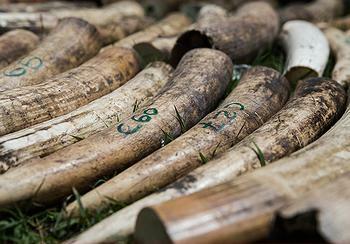 Authorities are investigating to establish the source of the ivory seized today. Kenya is working to raise public awareness of criminal wildlife trafficking, particularly the illegal ivory trade, which international monitors estimate has tripled since 1998. In June, the “Wild and Precious” International Airport Exhibition of images by seven photographers was installed at the Jomo Kenyatta International Airport on the occasion of the first United Nations Environment Assembly. At least 15,000 African elephants were illegally killed in 2012, according to a preliminary estimate reported to the December 2013 African Elephant Summit by the Convention on International Trade in Endangered Species, the IUCN’s African Elephant Specialist Group, and the Wildlife Trade Monitoring Network, TRAFFIC. This number is down from an estimate of 25,000 African elephants killed illegally in 2011 published by the same groups the previous year. “The overall trend appears to be leveling off in 2012 compared to 2011, but at an unsustainably high level,” they said. The reports say that poverty and weak governance in elephant range countries, together with demand for illegal ivory in consuming nations, are the three key factors identified by repeated analyses as being most strongly associated with observed poaching trends.